I checked this book out from the library because I have felt like I was floundering lately. You know the typical; can't get anything done, am I doing the right thing, what is best/worst, what are other parents doing???? This book did NOT let me down! 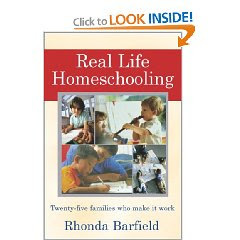 One thing that appealed to me in Real Life Homeschooling was that there were so many families with so many different situations. I found myself gleaming information I felt was helpful, encouraging, reassuring and inspiring. One of the many things that resonated with me was that most families lamented to the disorder of their homes! Each family managed that disorder in different ways (I'm going to make you read the book to find out how!). I am a clean and order person living in a messy disordered house, so the many tid-bits on this topic were helpful! I was also impressed with the level of commitment these parents have to their children and the varied ways they find, and define, education and experience. I realized, through my reading, how important consistency and a commitment to following through can positively impact and expand educational experiences. Sound like common sense? It should be but, when we homeschool, it is all too easy to let some things fall by the wayside without a second thought. Another point that was a reiteration of previous knowledge was the underlying "goals" that most parents had. I don't mean goals as in let's learn Spanish this year. No. When I was working on my Early Childhood Education degree, we had to submit an Action Plan and a Philosophy paper as our final project. My instructor described it as a paper that would explain, "Why we do what we do". Homeschool is no different. I have thought it before and seeing these families putting it to work has inspired me to take my "Action Plan" more seriously. What do I want to accomplish between now and when my children graduate? Not merely academics, but more-so spiritually and ethically. What is our purpose and what purpose do we hope to instill? All of these families attest to the good days and the bad. All of them are REAL people! They offer up samples of a "typical" day, curriculum they use (or don't use! ), and inspiration. They all appear genuine and it is because of this authenticity that I have filled pages in my notebook with notes and quotes to remind me and help me in each step of my days as homeschool mom. This book has me thinking about what we can be doing.... and what we can be doing better! My hat is off to Rhonda Barfield. I highly recommend this book to ANY homeschooling parent, new or old, who ever feels discouraged or frustrated or at a loss. It is wonderful inspiration!